F2F | What Does F2F Mean? 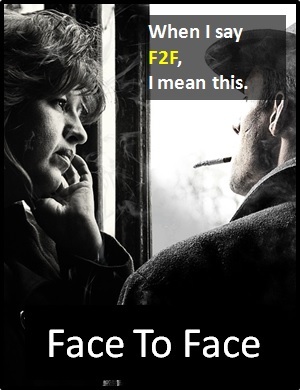 F2F means "Face to Face". The abbreviation F2F means seeing or meeting someone person to person rather than online or by telephone. "Face to Face" was also a song recorded and released by French electronic-music duo Daft Punk in 2001. The song topped the Billboard Hot Dance Club Play list in 2004. "Face to face" means to meet in person. Liam: Do you want to Skype tonight? Saskia: Are we ever going to meet F2F? Ryan: Why are you wearing so much make-up? Tanya: I've got a F2F interview later and want to look my best. F2F is classified as a cyber term as opposed to an initialism abbreviation or an acronym. Initially, cyber term terms were introduced for brevity, but, particularly with the advent of predictive texting and on-screen keyboards, they are now mostly employed for fun. Cyber terms differ from icons because they are not pictorial representations. F2F can be both an adjective, as in "the two men had a face-to-face conversation" or as an adverb, if referring to direct confrontation (e.g., "she came face-to-face with her attacker)." Before the digital era, we might have said something like "face-to-face" instead of F2F.